Oh sweet summer, there’s so much to enjoy. When it comes to beating the heat and treating myself to something refreshing, I’m all about iced coffee and ice cream. Putting these two yummy treats together makes for an epic afternoon full of smiles and sunshine. 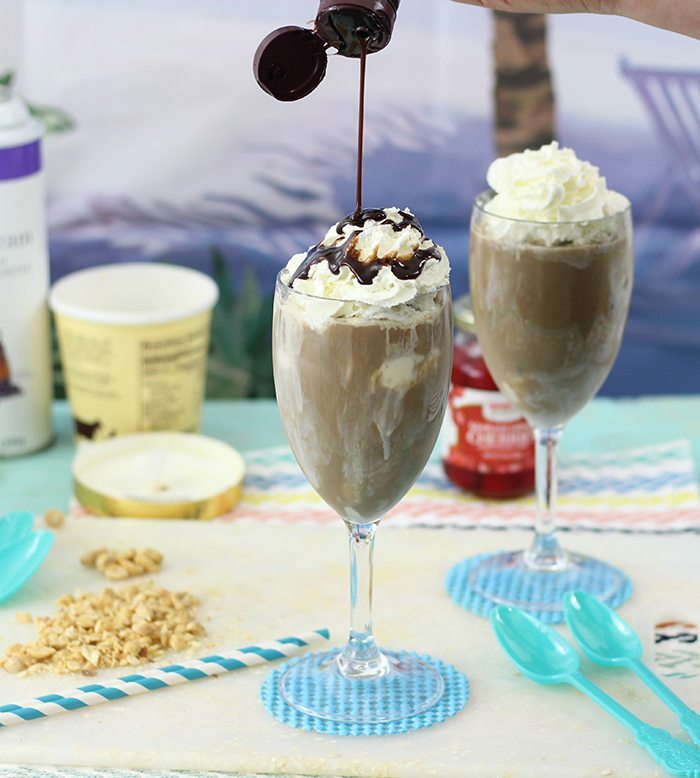 These Hot Fudge Sundae Iced Coffee Floats are the perfect way to celebrate summer! This is a sponsored post about International Delight Iced Coffee, all opinions are mine. 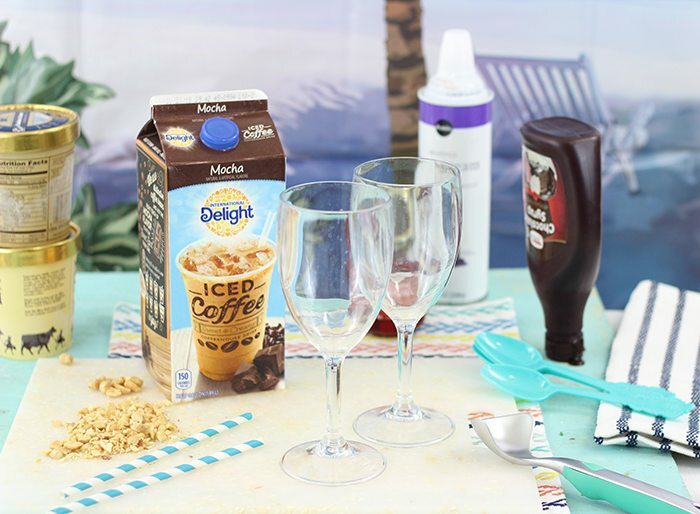 It’s easy to make your own afternoon pick me up with the help of International Delight Iced Coffee. It comes ready-to-drink in a variety of regular and light flavors like Iced Coffee Mocha and Iced Coffee Caramel Macchiato. Are you drooling yet? These are great to keep on hand, especially in the warmer months. You can save yourself a trip to the coffee shop and pour something fabulous right at home. 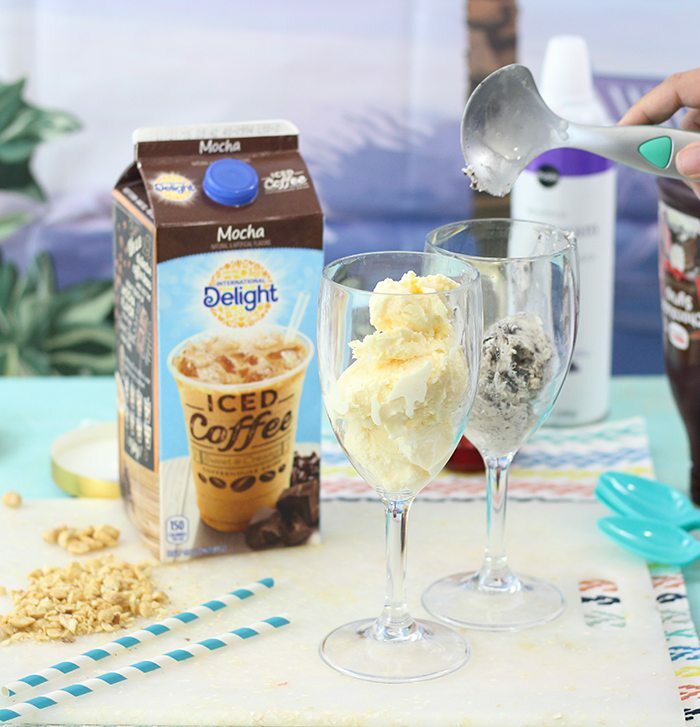 Are you ready to create iced coffee floats with me? It’s so simple and unbelievably delish! 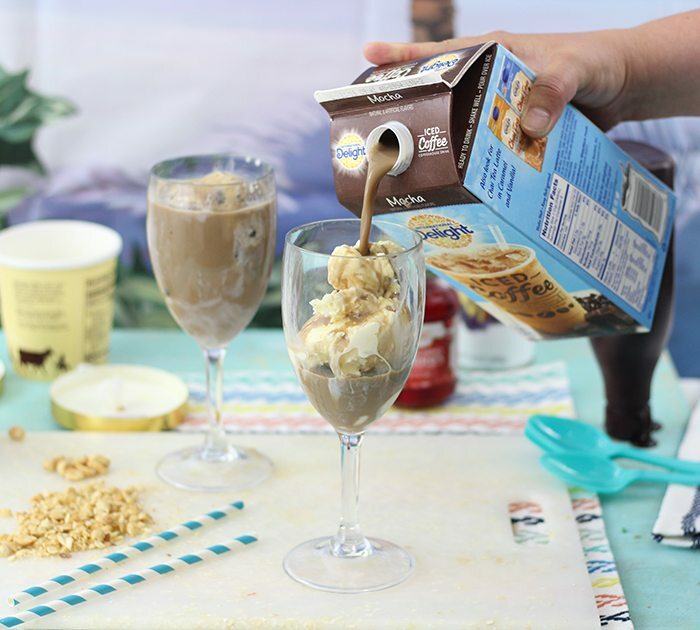 To make these floats, you’ll need International Delight Mocha Iced Coffee and all of the fixings for a traditional hot fudge sundae. 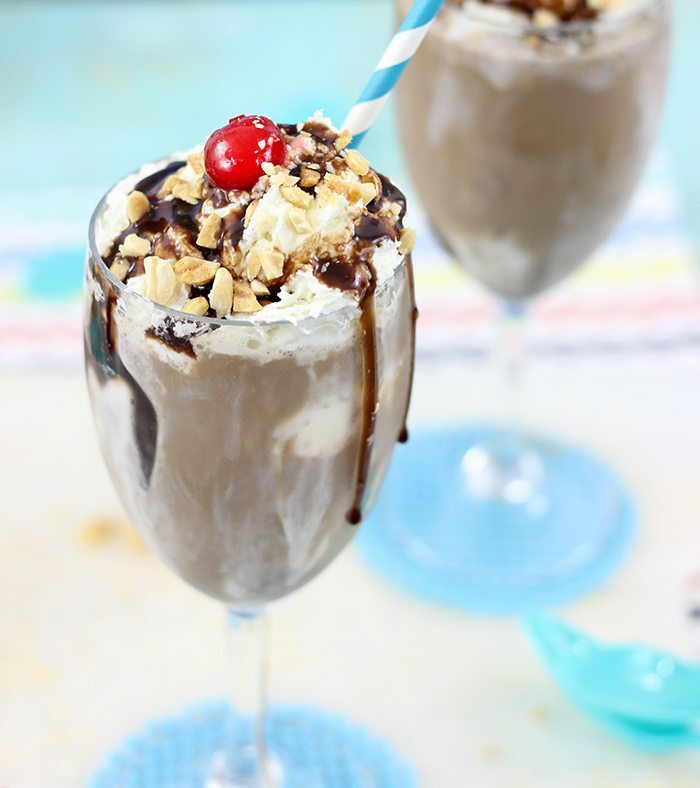 Vanilla ice cream, hot fudge or chocolate sauce, whipped cream, nuts and maraschino cherry. You can go crazy and add some sprinkles if you like too. It all starts with 2-3 scoops of your favorite ice cream! 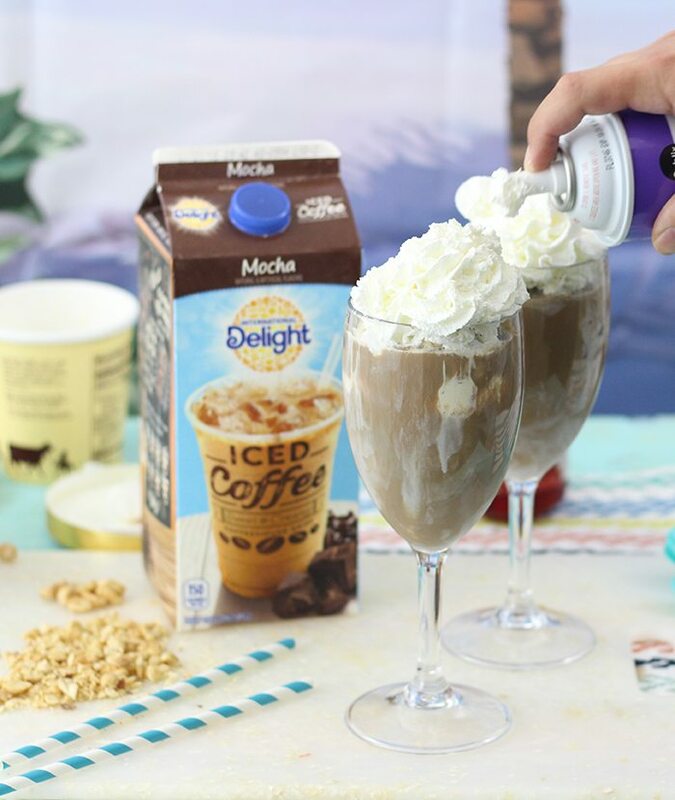 Pour International Delight Mocha Iced Coffee over the ice cream. Mmm. Here’s where all the magic goodness starts happening. Then top with whipped cream and lots of it! Drizzle your favorite chocolate sauce or hot fudge over the top of the whipped cream, the messier the better. Then, top with chopped nuts and your cherry! Mmm. 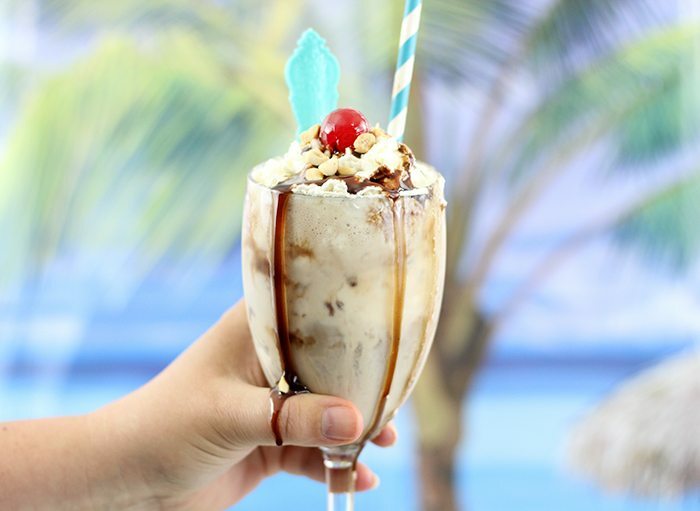 To make one float, in a medium sized cup, add 2-3 scoops of ice cream. Pour Mocha Iced Coffee over it to cover. Top with whipped cream, chocolate, nuts and a cherry. Enjoy with a spoon and straw. Sign up with International Delight now to get an INSTANT COUPON. Stay in the loop for more fabulous summer ideas by following them on Facebook, Twitter, Pinterest & Instagram. How will you take a summer afternoon to an all new level? Ooh French Vanilla Cream on Strawberries sounds absolutely incredible. Thanks for sharing that idea, I'll have to give that a try ;) Hope you enjoy your Iced Coffee Float, let me know what you think! wow Dawn these photos are amazing...everything looks delic. also, i have had a few iced coffees lately and love them. i would love to try it mixed with ice creat. Oh wow, that looks delicious! I would have never thought of making this but I totally want one now. Mom's own ice cream sundae with coffee! I know that you are probably just like me with coffee -- it's way too hot here in Florida for hot coffee! This is the best idea to indulge in coffee with a bit of ice! Coffee and ice cream??? This looks amazing what a perfect summer time treat!! I love International Delight Iced Coffee. Their iced mocha is so yummy that we can finish the carton within 2 days. I never thought to make floats. That's a genius idea, especially for the summer! Those look delicious! I actually have some of that coffee in my fridge right now but I've never though about making a float with it. Genius! I am a coffee fanatic, so this type of float is like a dream come true. I can easily see myself needing this type of afternoon pick me up every single day! This looks like the perfect drink I need about now! I love creamy coffee goodness like this! This would nee a perfect drink on a hot day! We are going on a vacation to the beach this weekend this would great for that! All my favorite things! Iced coffee is perfect for these warm summer days, running around entertaining the littles. But with ice cream added, it makes for mama's perfect treat. I didn't know International Delight made iced coffee. I never thought of pairing iced coffee and ice cream, but it sure sounds, and looks, delicious. Thanks for sharing. It's seriously so yummy, hope you can try it! I love that it's just to easy to do since the iced coffee comes ready-to-drink right from the container ;) Thanks for stopping by! That looks delicious! I love International Delight Mocha Iced Coffee in the summer. Thanks for sharing the recipe! Hiya Jackie, thank you so much! It was sooo yummy! It's a pleasure, thanks a bunch for stopping by!